Hi again. So, I thought I would just share a couple photos of both Lil Wizard's I had been fortunate enough to pick up over the last little bit. The red and white one came to me as seen, and I mounted a Cox Babe Bee on it for now. I am not sure if it will have enough to pull it around or not, but we will see as I will be using approximate 30 foot lines on it. And teh second one, blue and silver, was recently aquired this past weekend. It sports a McCoy .049 No.2 engine with roto start that works! I just cleaned it up today after sitting for a day in fuel to loosen it and clean it up. I like teh homemade mount the gentleman made for it. 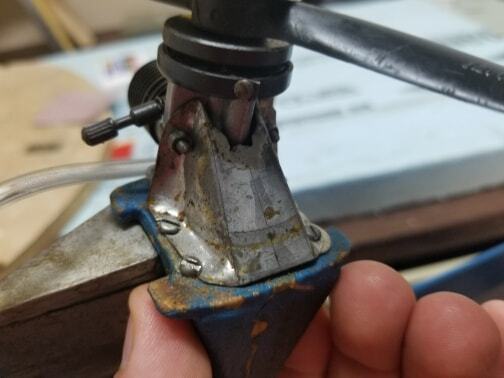 Also to note, the bottom of the crankcase in teh lower center is broken off and missing, but as luck has it, the rear backplate/plug still has a good seal, and I am also assuming the gentleman flew it like it is. Also, he made teh fuel tank that is installed, and I ran some fuel through it and it was clean so I re-installed it. The biggest thing though, is that the glow head on the McCoy has a small issue. When hooked up, it sort of 'flickers' on and off. With no spare on hand, I am hoping I can at least get a flight out of it. If not, I will be removing the engine so I can drill and tap the head for a standard plug. I hear that they are not as bad with the conversion as the Cox engines are. 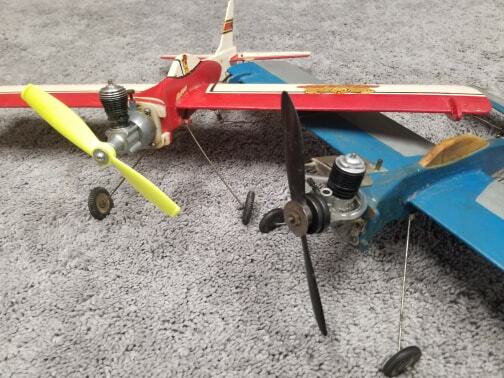 So, here they both are, nothing fancy, but will both get flown once again after sitting many years. 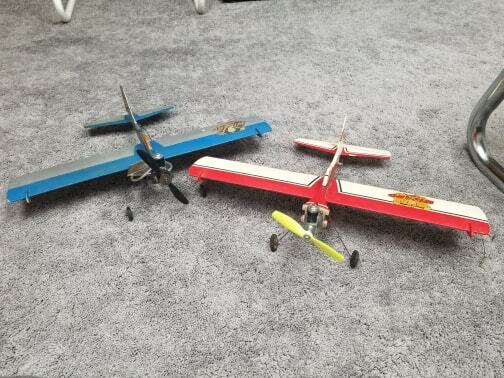 I will just be flying them as they sit pictured. I have a McCoy with a home made head & standard plug. I've only ever bench run it but sounded like it was doing what it should. An adapter is available from MECOA. Lots of job lots of McCoy/Testors/Wen Macs on ebay at the minute. Maybe pick up a few junkers and you'll get a good head. NOS ones come up pretty regularly but do command quite a high price. Yeah, I know the bay! I am at least hoping to get a run out of this thing as it is. Just to make sure the engine does indeed run before spending money on it. Especially since the case is broken, although it feels still good. I just may remove it for a picture or two to ask those more knowledgable than I their opinion. Ok. So I just disassembled the front end and took a couple pictures of the area of damage. Also the nice little engine mount the fellow made to hold a beam mounted engine. It is rather very solid and light. Very nice design. Also to note, depite the break looking that bad (looks worse in the picture), the mating/sealing surface around the plug is whole and intact. I also put fluid there to look for bubbles and did not see anything, whether or not I would, I do not know, but I checked. Also as mentioned earlier, it has a good 'pop' when flipped over by either hand or spring starter. Just a word of warning. 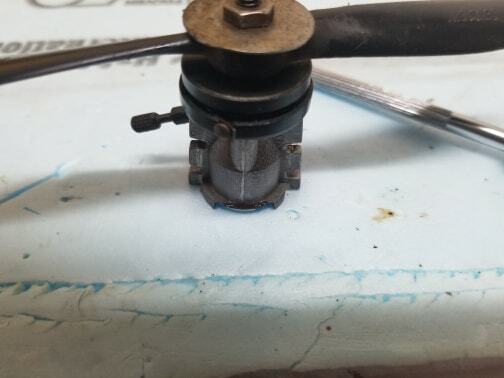 The spring starters work great but are notorious for breaking the end off the spring. Do Not wind back beyond 1 turn. Also, check the tightness of the centre post of the head. I've seen them loose. Maybe that's the cause of your "flicker" in the glow element. Oldenginerod wrote: Just a word of warning. 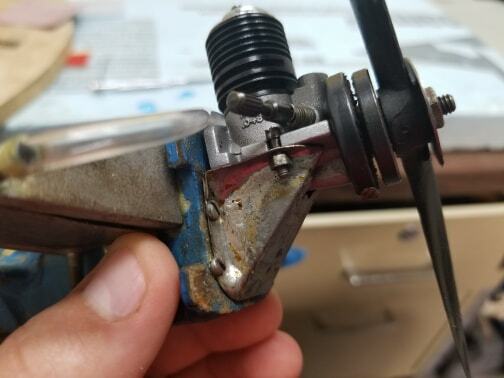 The spring starters work great but are notorious for breaking the end off the spring. Do Not wind back beyond 1 turn. Wise words from Rod! These starters will last a LONG time if wound one turn or less (just a bit past compression). Those will bee some fun to fly for sure , hope you get the McCoy to run for U . If it were me i would run the fuel hose around the bottom instead of going right out the tank and then up to get over to engine. That tank looks like a wedge of cheese lol PO did do a good job on that and the mount . Hope ur weather clears so flying can begin !! X3 on that rotomatic starter Chancey. I like them better than the spring Cox starters, much cleaner and work great if somewhat fragile. Clean the goo off the threads on the head and engine and tighten it down. 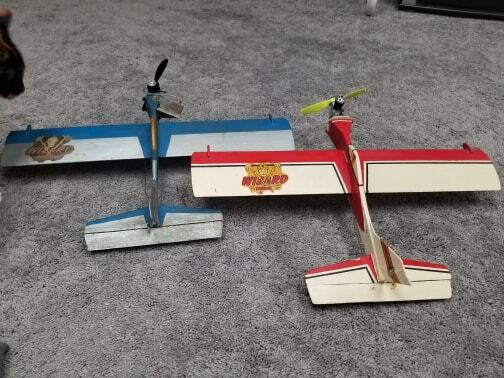 Nice looking pair of planes with innovations. The Wizards fly pretty good. All my little buddies had them when I was a kid.I guess thay are all 60 now. Any .049 worked well. The Wen Mac is fairly good. I did some tests with a 4 1/4 -4" APC prop and it held it's own. I wouldn't worry about the broken lug, but when the plug blows, try and get someone to put in a Turbo plug rather than the standard one. You will lose what little power you have. Try and find someone local or do it yourself. I could do it for you, but the Canada Post would likely bee over $10 each way. I think someone still sells the plugs, maybe MECOA? Location : Leamington Ont. Can. Thanks all for the comments, help, and suggestions. Especially the one about rotating the McCoy the opposite direction. It is very well noted now as before seeing the suggestion of not to do it, especially after doing it to loosen it up...... I will no longer be doing that again. However, if that truly is teh case of an easy way to break them, I can now see why so many are no longer working! Unfortunately Merlin Plugs seem to have gone under after Al died. That is a good method though. 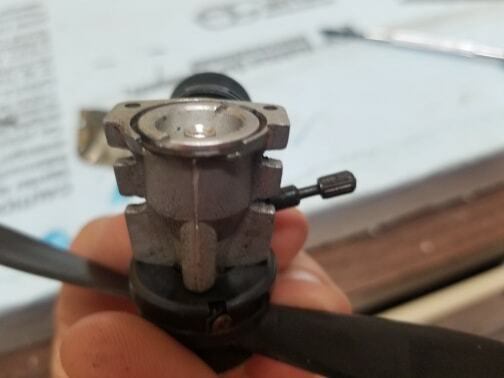 The Norvel plugs may be available still and could use that method, and I believe a turbo plug can be made to fit in the stock head if it burns out. That was a good little video. I sure hope mine starts a nice as that one did! I will possibly have some free time tomorrow to try it out and see if she fires up, that is after I figure out the problems with one of my chainsaws. I know Thursday is out as I will be going to the cottage to open up for the year. Then there's always Friday. A Babe Bee has plenty of power for a Li’l Wizard. Flown one myself, it’s even the suggested engine on the building instructions. Personally I would be more worried about the Wen-Mac and enough power. Although I am sure it will be fine. That tank setup is questionable. The pickup should be placed the exact opposite of where it is now. The Wizard was a beginner plane and designed to be very nose heavy. It’s not a stunt plane even though you can do some very large loops with it. An integral tanked engine makes much morse sense all around. I guess fly it and see. Ok. So after my post yesterday, my day went worse. 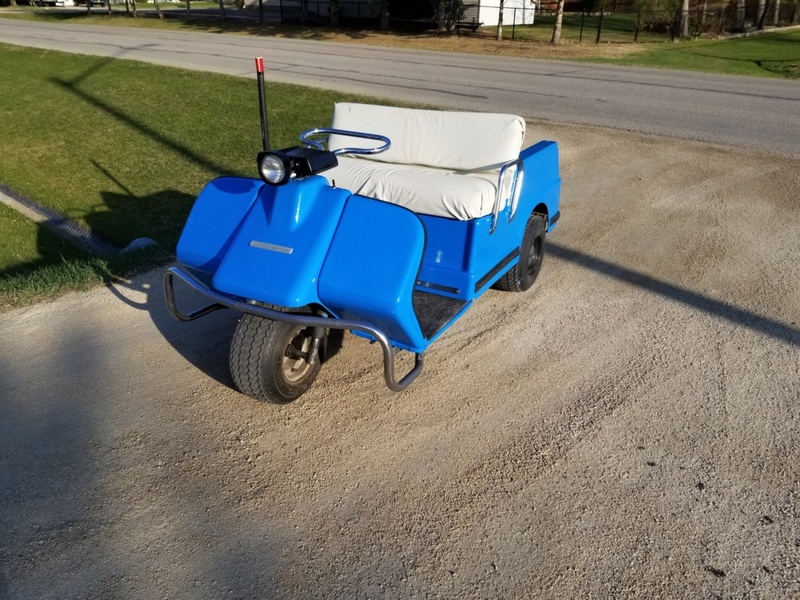 I was happy to get my golf cart back running for the season, which was unexpected yesterday. So my dad and I went for a drive around our area here and all was well. Got home and then started having problems. Changed battery, nope, solenoid, nope again. Look at forward/reverse switch/lever, disassemble and clean. Nope again. Frusterated now start looking at wiring. Well, wouldn't it simply be the on/off toggle switch wire unplugged! But while looking at it, discovered the switch is also damaged, so replaced that. Now onto the chainsaw. Well I let it sit overnight and a few pulls later, going good. Just have to do a little tuning, but want to run it a bit before tuning and jsut see if it isn't my winter fuel I had in it (premium guel/oil/Seafoam mix), and I do know Seafoam does make things smoke if a larger amount is added. I picked up this POulan P3314 in December last year very cheap as the person and his brothr could not get it running. So I got it running right away, but while I couldn't tune it discovered the clutch was shot, so I replaced that and now it all appears fine. But, now for the main event!!!!!!!!!!!!!! I cleaned off my chainsaw stuff from my multi-purpose workbench. Brought out the Lil Wizard with the McCoy. I disconnected teh fuel line I had on it and just tried a drop in the exhaust and a squirt in teh venturi. A coupel flips later, it barked a few times. Just did not stay running. It appeared to bark well, so I added a small balloon tank to the fuel inlet. Fired but did not stay running. Here is when I am thinking the plug is just no longer good. I debated drilling it for a short plug at this time. Then thought I would back out the needle some more. Then it lit off and stayed running, rather very well. This was with the needle out a lot, approximately 5 - 5 1/2 turns. So, I filled the homemade wedge tank and tried again after it ran so good. Now it wouldn't run steady only a minute after doing so. 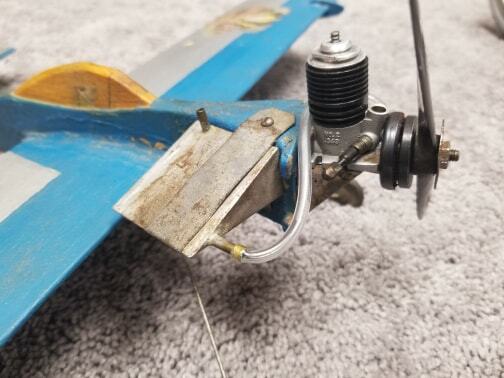 I turned the needle back in again to about 2 turns and primed the engine and it fired again, but did not stay running. 3 turns out, it started and ran sluggish. Back the screw out and it stayed running. I was happy. As it ran, I watched the screw vibrate and turn on its own. As I grabbed it, it was very wobbly and I am now sure there was an air leak. So I will now remove the spring and install a piece of fuel tubing, and I am sure this will fix the starting problem, or at least I am hoping..... Also, while running, I saw the fuel in the line, and as the engine ran decent, it was surging due to the fuel bubbling and foaming steadily. So, I have to find out why it is doing that, as I have no clue. Mybe a piece of foam between the tank and where it is mounted? Worst case is I install a balloon tank. It did have a good amount of power when it ran strong between the bubbling fuel. I even got 'bit' by its McCoy propeller while adjusting the needle. So all-in-all, it was a good day here for me! Thanks for reading. P.S. I have a Bee ready to mount on the other firewall should I choose to run it with it. I am going to cut another firewall out right away so I can mount the McCoy on one and the Bee on the other and switch them out readily! You should write a book. Oh, ok you did ;-) Looks like 5 turns is where it is happy. I ran my McCoy on a 4 1/4 - 4 APC prop to compare to other .049s that I had, and it came out in the lower middle of the pack, 19,500 rpms. This is a kind of small prop for normal use, but I think the Bees were less. I have lived your life Chancey, right down to the Seafoam. We had a summer cottage on Onway lake in New Hampshire. Mom taught school so every summer we would pack up and move there for almost three months. Swimming, boating, hunting/fishing and girls. Had my share of dealing with engines. 1937 Ford V8 and up. 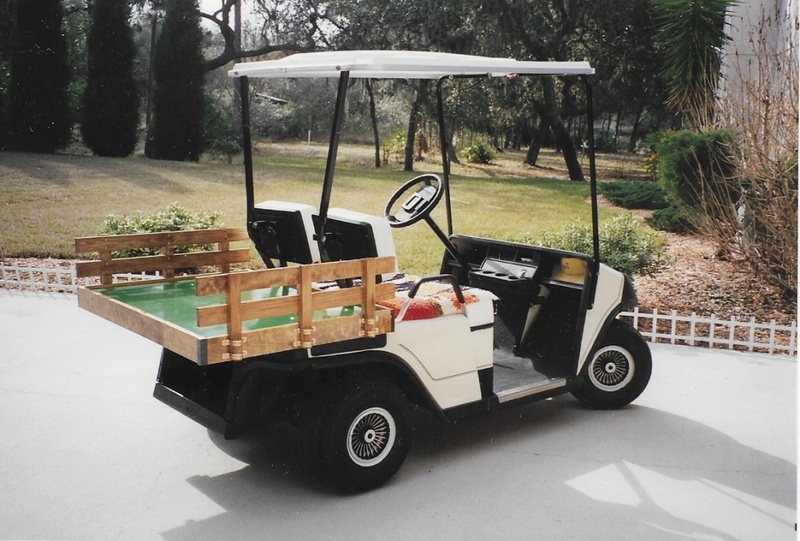 Many years later when we retired to Florida I bought a golf car and converted it to a stake bodied truck. Electric. No Seafoam required. I ran a lot of model engines off that cart, ran my Cox .010 off it. Thanks guys. 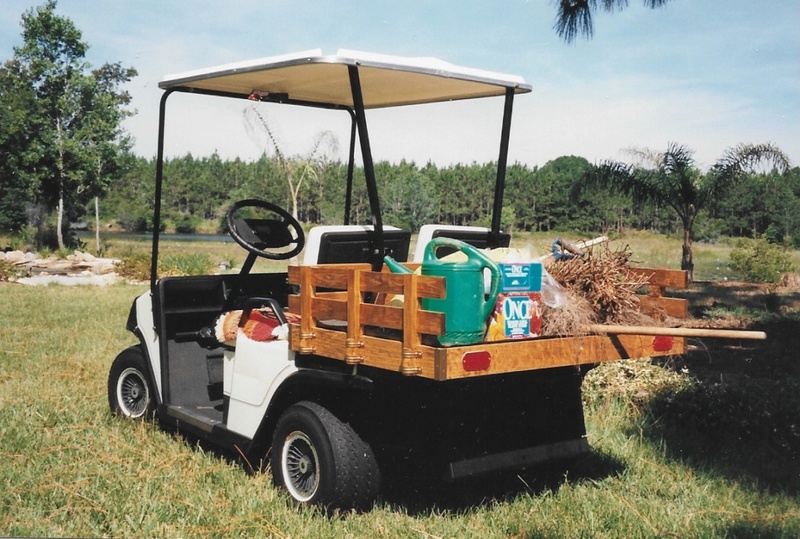 That is a very nice cart there, especially the nice wooden box. Electric carts are nice, but the batteries are a killer, especially since they are only used for approximately 5 months. My parents had an electric cart first, but at the cabin, there is a lot of big hills where we use them, and that had seemed to drain the batteries rather quickly, so we went to fuel. 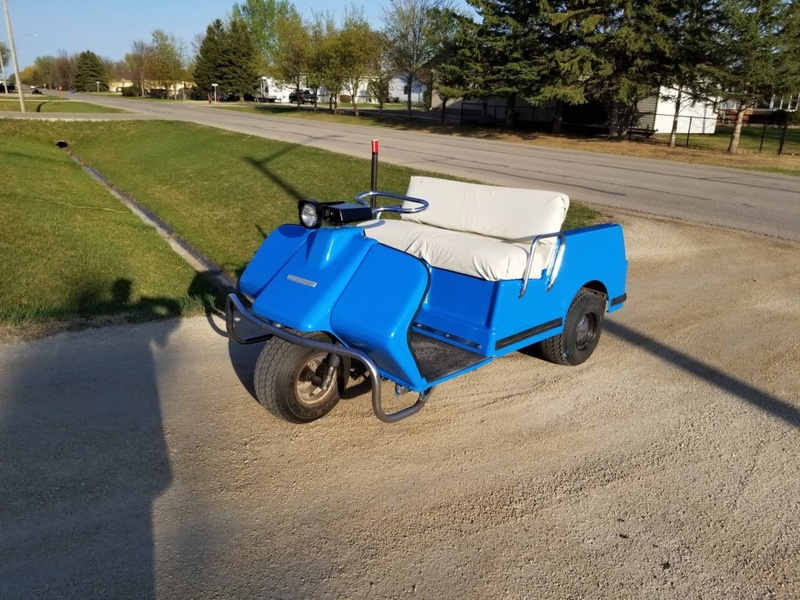 We have newer Yamahas at the cottage, but the one here in question is a 1978 Harley Davidson 3 wheeler. It was rough so I just gave it a quick splash and use it to get the mail and visit my parents around the corner. It was supposed to be sold to offset the cost of the Yamahas, but I have avoided that so far (sold our 2 four wheeled Harley Davidsons only)...... I liked our old Harleys because of the big 'box' in the back, so I did not have to modify it to haul stuff around. I do really like your woody box on your cart.